According to the Kiev Department of Statistics the total population of Kiev in January 2015 was 2,888,000. 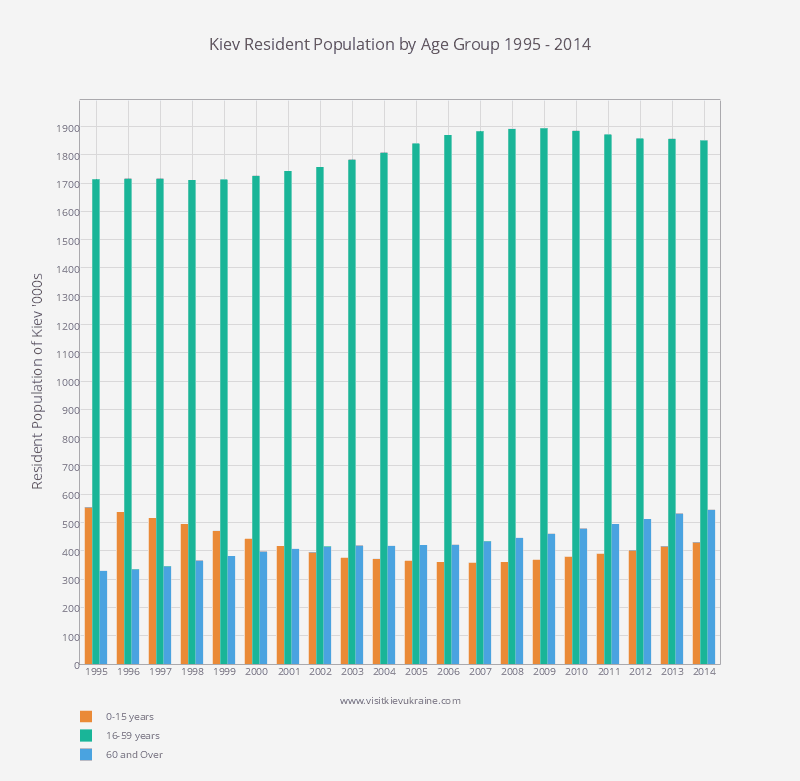 This figure for total population includes temporary residents and visitors. The permanent resident population of the city was 2,878,000. 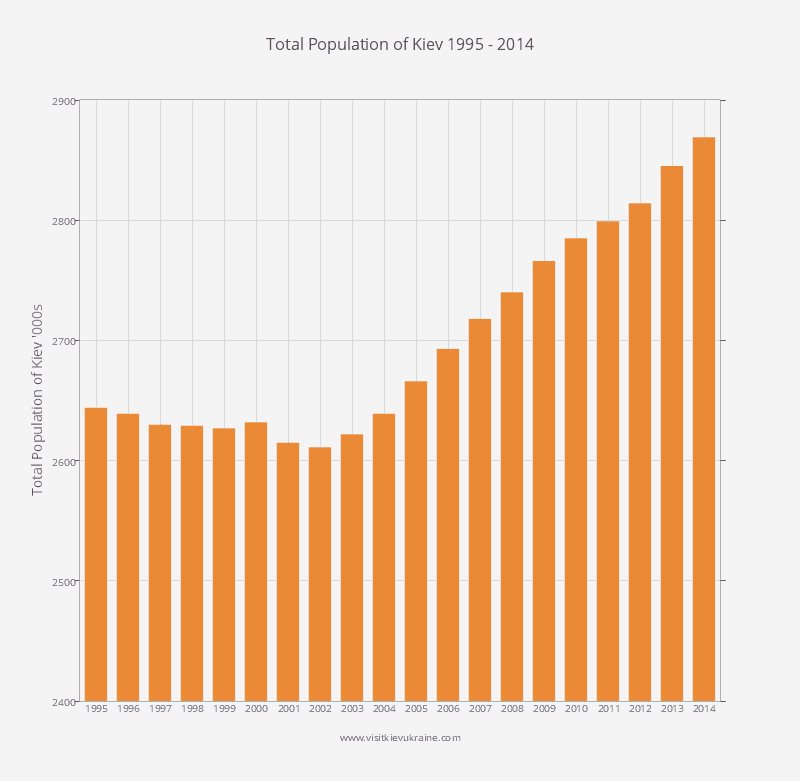 Historical data, shown in the table and graphs below, shows the population of Kiev has increased in recent years. 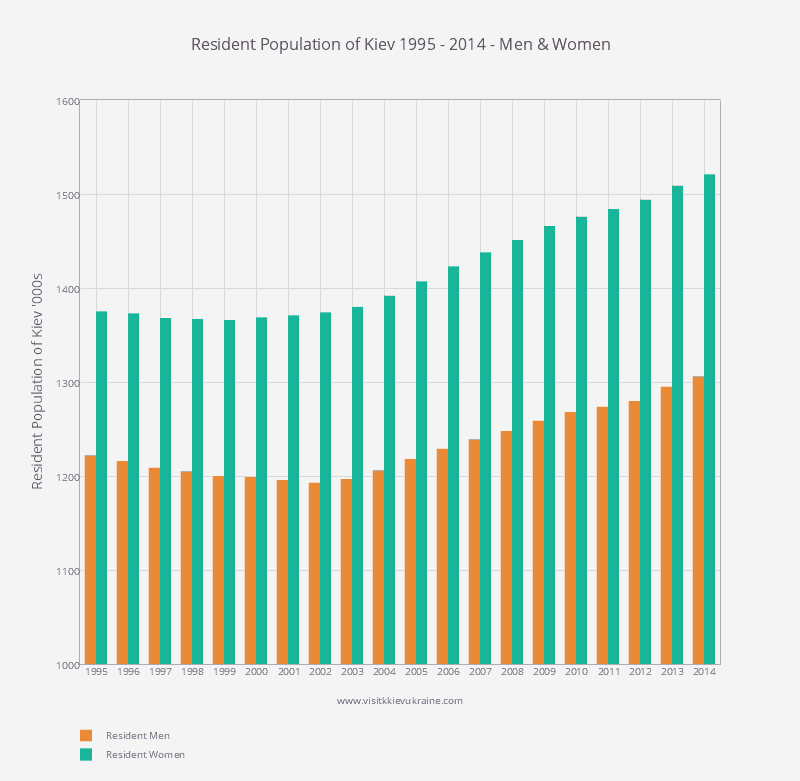 It also shows there are significantly more women than men resident in Kiev. The number of children in Kiev fell dramatically between 1995 and 2008. Since then birth rates have risen and the number of young people is rising again. According to the State Statistics Service of Ukraine the total population of Ukraine in 2014 is 45,426,200. Historical data going back to 1990 is shown in the table and graphs below. 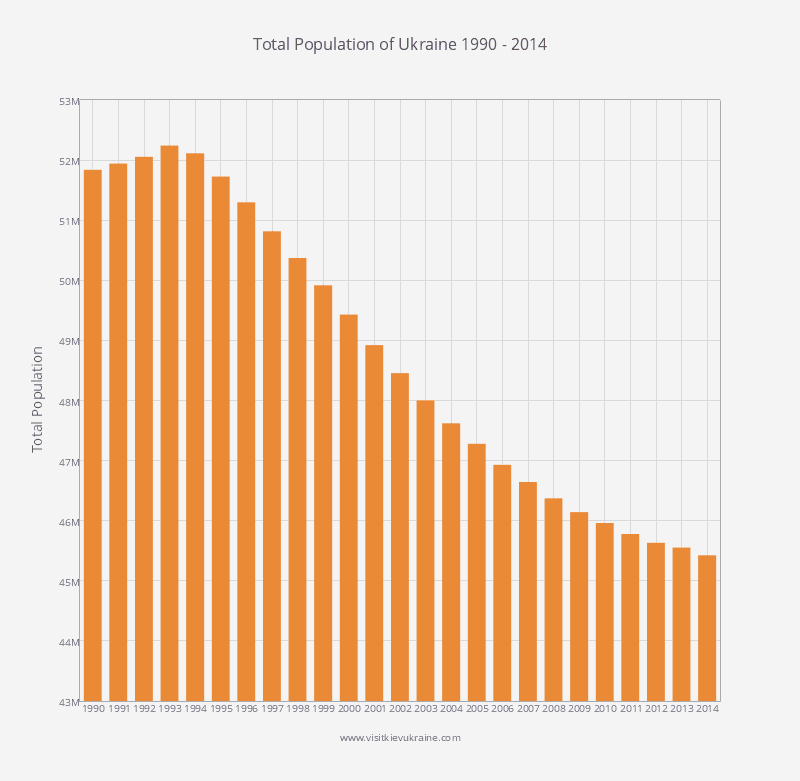 The population of Ukraine has fallen sharply in recent years, from 51.8 million in 1990 to 45.4 million in 2014. In 2013, the Institute of Demography and Social Studies at the National Academy of Sciences of Ukraine forecast that it will fall to around 36 million people by 2050. The UN forecasts a population of 33 million. The reasons for the decline are mainly due to the poor state of the economy. Hundreds of thousands of Ukrainians have emigrated to the EU (mainly Poland, Italy, the Czech Republic, Portugal, and Spain) while around 1 million are estimated to live in Russia. Since the country gained independence in 1991 approximately 250,000 left to live in the United States. Although birth rates are now rising in Kiev and western Ukraine, deaths far exceed births in the east of the country. The eastern regions have suffered most from the poor economy, resulting in high rates of alcoholism, drug abuse, and HIV and AIDS. The most recent full Ukrainian census was carried out in December 2001 by the State Statistics Committee of Ukraine. 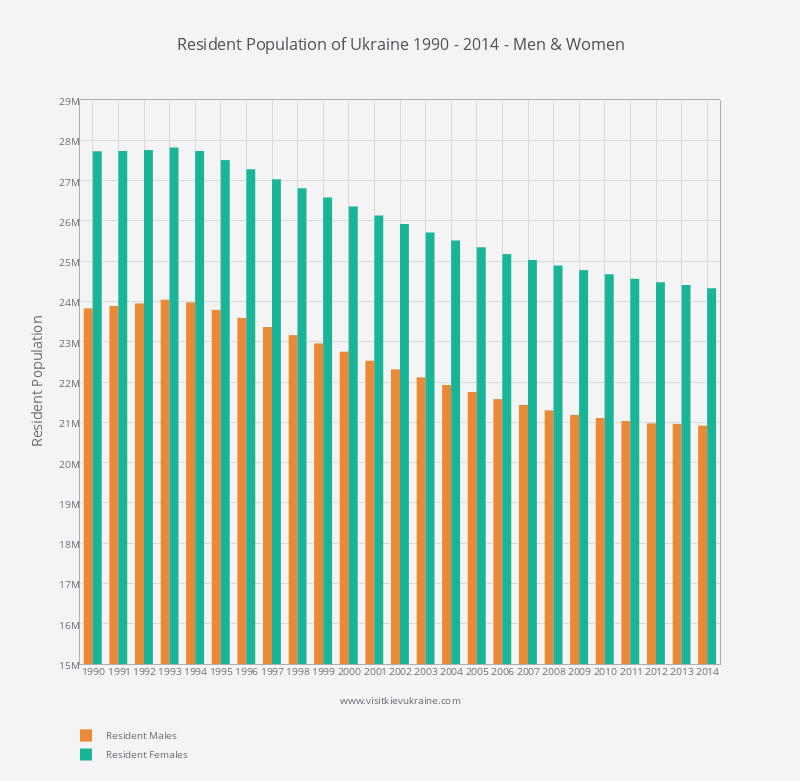 It was the first comprehensive census since Ukraine gained independence in 1991. In 2010, the Ukrainian government postponed the 2011 census until 2012. It has been delayed many times since and is now scheduled to be held in 2016. You have not published the Kyiv metropolitan area population. When the World Atlas does its calculations ranking cities in Europe it counts the metropolitan areas, which for Kyiv is about 4 to 5 million. This is all that should matter, and not where artificial boundaries are drawn. So according to this data there are 0.25 million more women than men in Kiev? It must be heaven for single men then? Yes, if the official statistics are to be believed. I personally think it is actually higher. It is the same all over Ukraine. It is due to the large numbers of Ukrainians working abroad. I presume women are a little more reluctant or unable to relocate and this causes the imbalance. Bob. We are very aware of that. 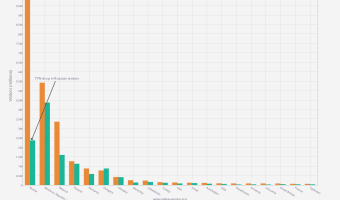 However, the vast majority of people still use ‘Kiev’ when searching on Google and other search engines. We have to optimise our pages so readers can find the information they are looking for. It is not spelled Kiev any more. It is Kyiv. Kiev is the Russian spelling. Kyiv is the Ukrainian spelling. See how Ukrainians used to live at this open-air museum just outside the city. Find out how many people travel to Ukraine, where they come from, and why they visit.